Central Coast Leagues Club is proud to support a number of charities and groups in the community. The Central Coast Leagues Club has supported Surf Life Saving Central Coast (SLSCC) for over 50 years. 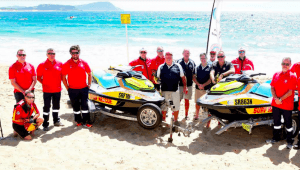 For the past five seasons the Central Coast Leagues Club has been the major partner of the SLSCC Lifesaving Support Operations Team which has allowed SLSCC to significantly increase the coverage of our Rescue Water Craft Service (rescue jet skis) and Lifesaving Duty Officer services across the Central Coast beaches. The funding granted to this service from the Central Coast Leagues Club Club Grants program has funded a new Rescue Water Craft for Surf Life Saving Central Coast annually, funded the operational cost of seven rescue jet skis and two rescue vehicles and provided our lifesaving support operations team with essential rescue equipment, uniforms and the training they need to save lives and respond to coastal emergency incidents at Central Coast beaches. Thanks to the support from the Club Grants Program, The SLSCC Lifesaving Support Operations team has significantly advanced the service level provided to the community, leading to safer beaches, many major rescues made and a reduction to coastal drowning statistics on the Central Coast. Coast Shelter, for over 26 years, have been assisting and supporting those within the Central Coast community who’ve become homeless, at risk of homelessness and those escaping domestic violence. 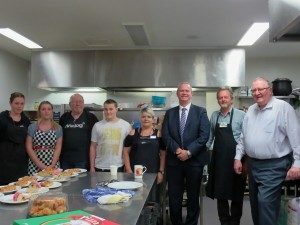 The Coast Community Centre provides free meals every day and support services to help homeless, vulnerable, financially disadvantaged and socially isolated community members. Support services include food hampers, no interest loans, energy vouchers, shower and laundry facilities, gifts of essential items such as clothing and toiletries as well as connections and referrals to other services. None of this is able to be done without those within our community who support Coast Shelter and from the day of inception, Central Coast Leagues Club have lead that support. The Central Coast Leagues Club gives back into the Central Coast community in so many ways, and Coast Shelter’s work to assist those who’re in need wouldn’t be possible without the commitment and spirit of the CCLC. Coast Shelter and the thousands of people supported over the 26 years thank the CCLC for their tremendous generosity.